The man in this photo is now married. Comedian Jason Beck, my very good friend and one of the few people who could pull me away from Just For Laughs, tied the knot this past weekend in Winnipeg. 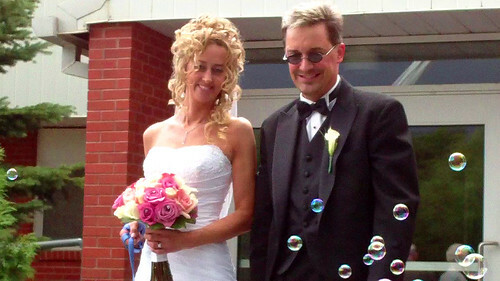 He did so after living with his girlfriend Chantal for – get this – 14 years. Protesting the concept of marriage the whole way. The event was worth waiting for — at least for us in attendance. I arrived at the church in unison with Trevor Boris, who pulled an all-nighter to get there from Montreal (he and his fancy Pam Anderson gala). He was told he’d be doing 15 minutes at the reception. 15?! He had been told 4-5. Ah yes, this is a comedy wedding. Even the formal proceedings were a comedy-filled affair. His affinity for rubber chickens became a mixed metaphor about love in a reading, their beloved dogs were in the wedding party, and Jason even managed to incorporate one of his standup bits into the decidedly un-stoic moment of placing the ring on Chantal’s finger. Oh, and did I mention HIS ring was engraved with Penguins logos? All this in a Catholic church. They managed to find a priest to fulfill most of their wishes, though he’ll likely be excommunicated for it. The reception was even weirder, of course. I’ve sat at many a comics’ table, but never never at a wedding. It was a true comics’ table in every sense, with three sets of notes being memorized and compared before each comic went up to the mic to roast the groom. Once the order was debated, Big Daddy Tazz got up and nailed Jason to the wall in a manner even Jeff Ross would envy. Trevor Boris did his 4-5 minutes infront of tables full of older folks who had no clue that he’s famous among 13 year old Canadian girls, and thus totally allowed to wear jeans to a wedding (long story). And the highlight was Dan Licoppe – who most would know as masked ape Mel Silverback on the 2008 season of Last Comic Standing – going undercover and doing the entire speech as Yoda. Yeah, Jason has a Yoda thing. I think you can see why I felt it was essential for him to lock this girl in. Four days later, I think I’m still a little hung over. But it was well worth the trip. 5 stars, A+, and all that jazz.